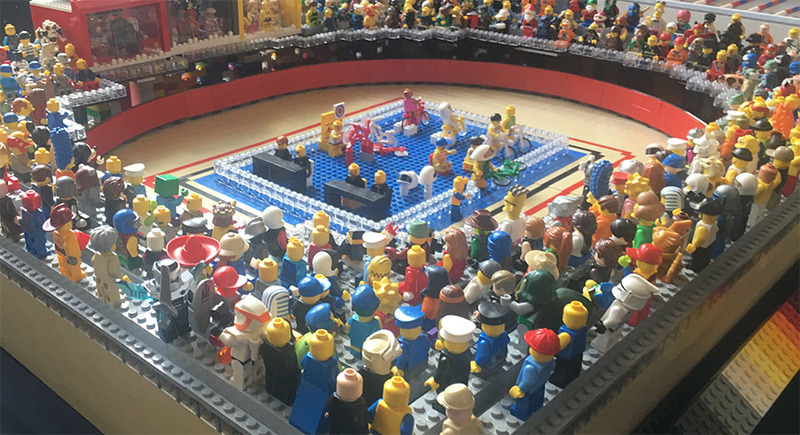 This August Bank Holiday weekend saw Hull’s second LEGO show in the form of Hull Block Con 2017. 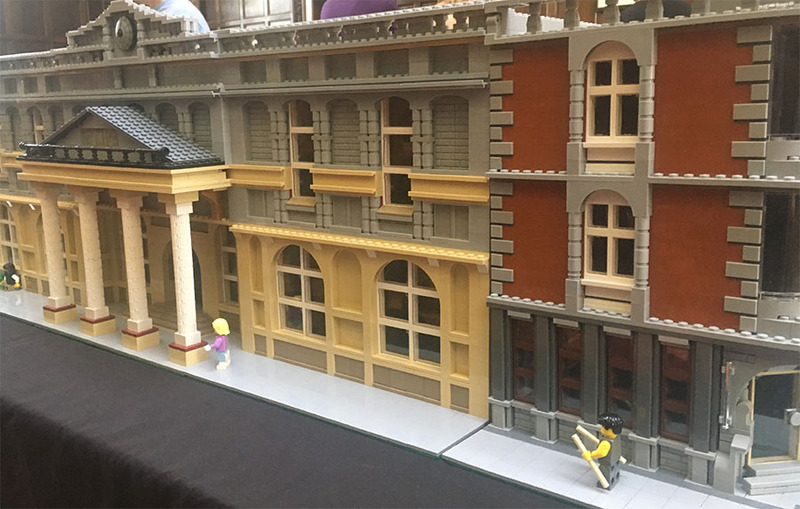 A one day LEGO show, Block Con’s tried and tested format came to Hull on Sunday August 27th. Held in the stunning Guildhall – the nicest venue I’ve been in for a LEGO show, by quite a stretch! – exhibitors and a play-bricks table occupied a large hall. LEGO-themed traders, accompanied by a not-inconsiderable pile of play bricks for those eager building hands, occupied a connecting chamber nearby. 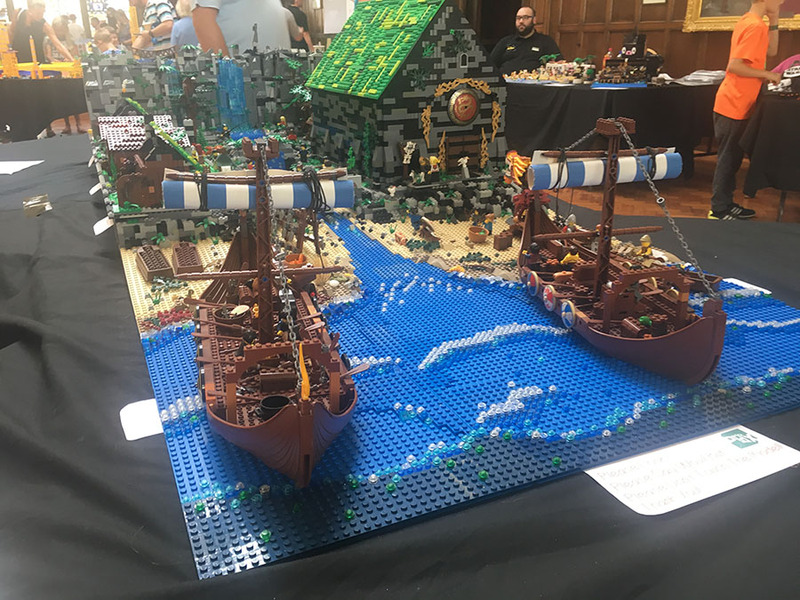 There were some fantastic LEGO models on display, including this epically proportioned Viking scene featuring longboats and a banquet hall by Chris McKnight; reminiscent of the “Lego-farne” model by the guys at Brick To The Past last year. Neil Burgess’ LEGO Olympic scenes were pretty stunning, too. I particularly liked his velodrome, with two cyclists competing (powered by a well-hidden LEGO train motor!) – and the crowds must require a few hundred minifigures for his growing number of scenes! Gavin Pell’s brilliant LEGO city with some large modular-style buildings was also nicely on display; some nice colour combinations and facades. 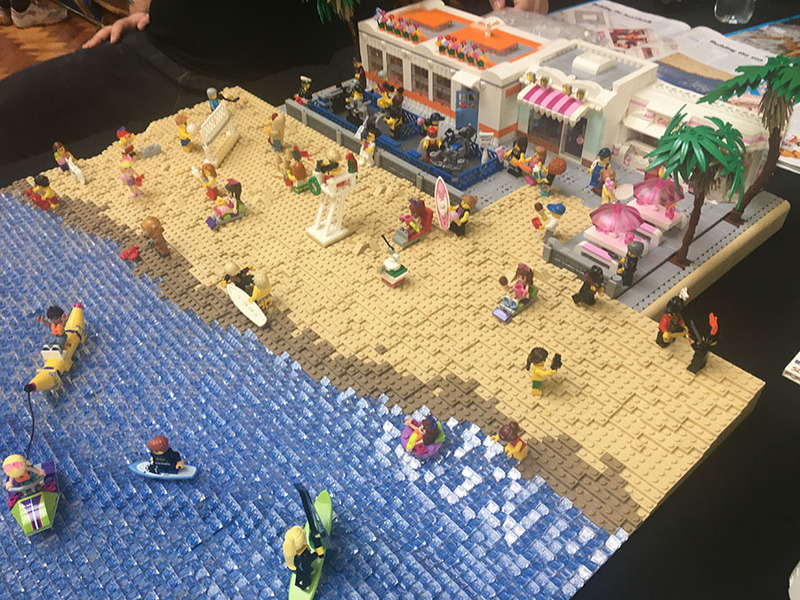 Also worthy of mention was Mike Freeman’s LEGO beach scene, which was recently used for a cover image on Blocks Magazine – some excellent detailing, and a nice blend of LEGO City, Paradisa, and Friends! 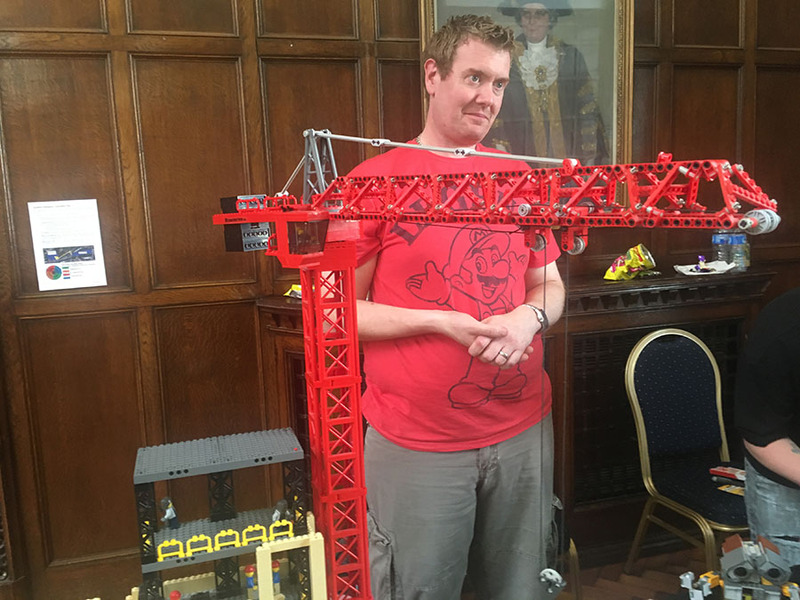 Finally, James Raper’s large LEGO City crane was one of my personal favourites (alongside his Intercity 225 – see below!). It was absolutely huge, and programmed to swing side to side, too – a nice tough which added a little animation – and excitement – for visiting LEGO fans of all ages. 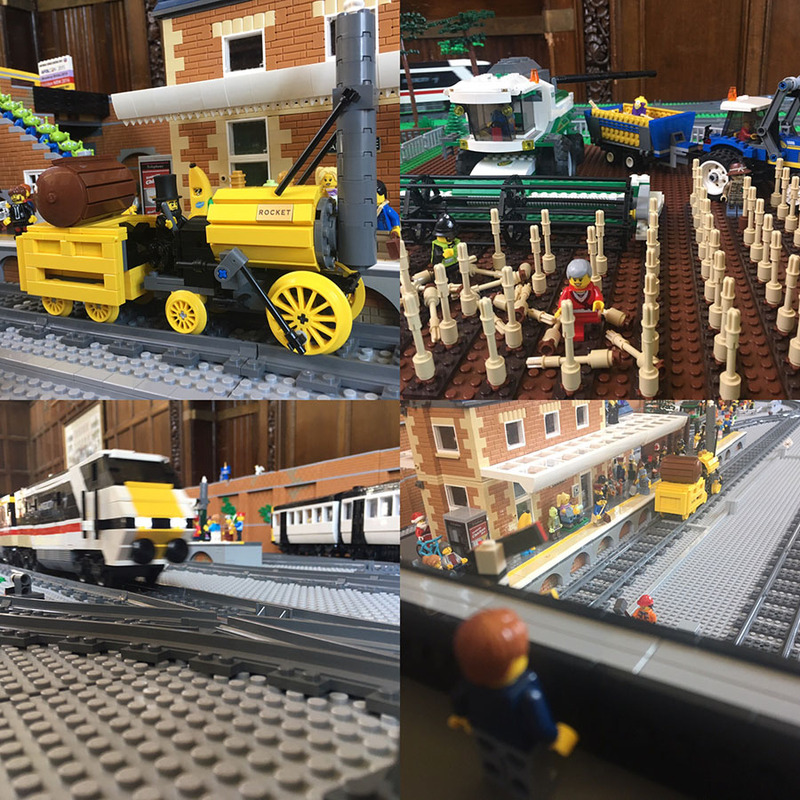 My LEGO display at Hull Block Con was a reworked Ambridge railway station layout, featuring the familiar field of wheat (this time with an errant Prime Minister running through it), and my newly completed Rocket locomotive. I also had the privilege of James Raper’s LEGO Intercity 225 running with all 9 of its carriages for the day (video on YouTube is below – quality seems to have dropped off a little bit from the original!). And that’d be my Brick Alley LUGmate, Matt, photobombing my video. There’s always one. The next LEGO show I’m attending is likely to be Brick Alley’s Shildon LEGO Show, but I may be displaying at Brickshire’s BrickLincs in Lincoln in October – just working out if I can make time to do it, and build something new to add to my display beforehand!